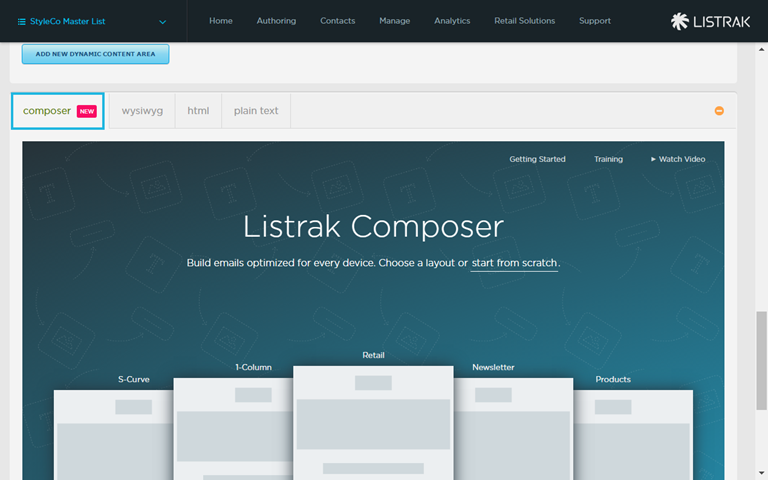 Learn how to easily build emails with Listrak's latest creation-- Composer. It's now easier than ever to craft the perfect email for your specific needs and campaigns. Listrak Composer is an easy-to-use, intuitive builder with a seamless drag-and-drop interface. And the best part? No coding required! Watch how easy it is to build a fully-responsive email in less than five minutes! Fill in your Message Settings as needed. Scroll to the design area, where you'll see a new tab for Composer. You'll notice that the traditional tabs, WYSIWYG, HTML, and Plain Text, are still available to you. From the Composer landing page, you can click start from scratch to build a completely custom email, or opt to start building from one our of five predesigned layouts. Below is an explanation of each layout and what type of campaign you might use them for. 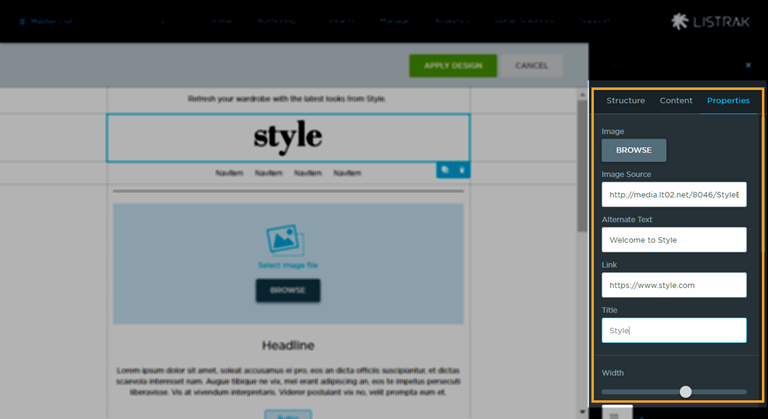 S-Curve: This layout features one large header image with call-to-action buttons followed by several staggered text-and-image components. 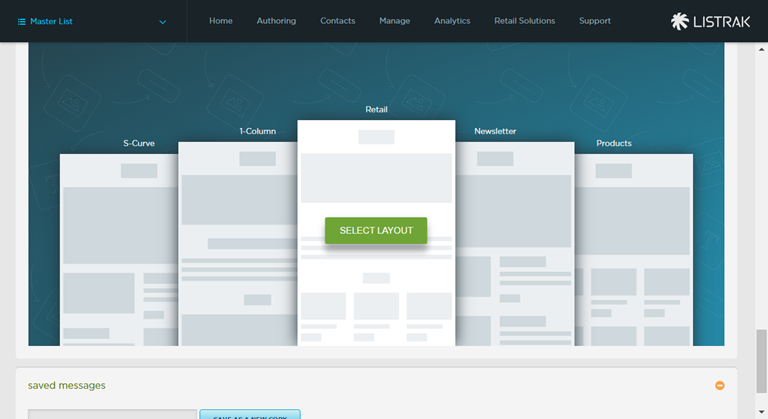 Use this layout to showcase and describe products or showcase topics for a newsletter-style email. 1-Column: This straightforward layout is the most optimized for rendering on devices across the board and is easy for the user to interact with. Retail: This layout offers a large logo image, a call-to-action button, several products slots, and a text area to include an offer for your customers. Newsletter: This option is great for newsletter-style, recurring updates, or content-focused emails. Products: This layout delivers what it promises. It's best used to feature multiple products and could be used as a gateway introduction to your product offering. Hover over your desired layout and click Select Layout. For this example, we'll select the "retail" layout. If you don't see the layout that's right for your email, easily build your own. Click the underlined text Start from Scratch. Click and drag the Structure you want (up to six blocks are available). Next, click the Content tab. Click and drag the component you've selected onto the layout. Select a Mobile Layout for each component. This is how the component will stack on mobile devices. Continue to build until you have your desired layout. In this section, we'll go over a brief overview of how to add components to your email. 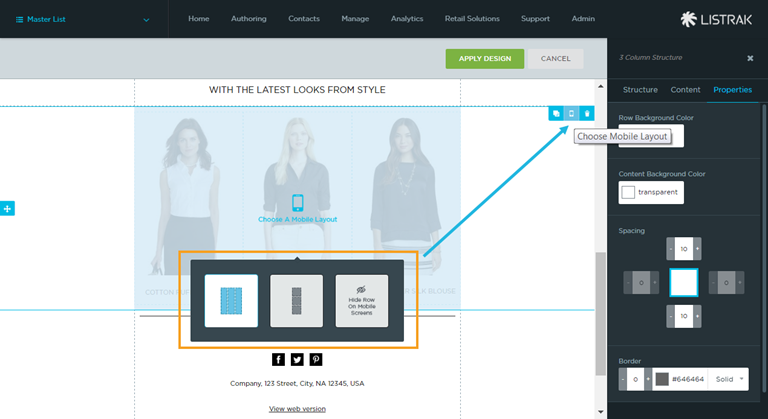 Create fully responsive layouts easily to ensure accurate cross-device rendering and insert and link navigational components to give shoppers easy access to products. It's a good idea to include a preheader at the top of your email because this is what the shopper sees in their inbox directly following the subject line. Think of it as a second opportunity to catch your customer's attention. Replace "Preheader text goes here" with your desired preheader text. At this point we can modify the text component (the preheader) by using the standard menu that appears when you click into any text box within Composer. The features work just like most standard word processing programs do and each function is explained below. There are several design options when it come to the rows that make up the different sections of your email. Click on the white space on either side of the content on the canvas. Select your row options as listed below. 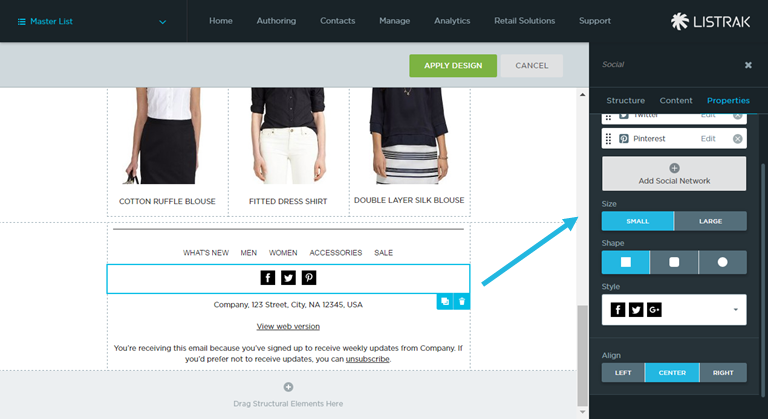 You have the option to either show or hide components when a shopper views your email on a mobile device. Click the Choose Mobile Layout icon. You can either choose the standard mobile layout or select Hide Row on Mobile Screens as shown below. The mobile rendering options are different for each component and depend on the number of elements that are contained within the component. Access the mobile options for any component by clicking on the component and then clicking the Mobile Layout icon as shown below. A/B vs. B/A Mobile Layout: You may want content in the right column to be positioned on top in the mobile view. The two column options allows you to select whether content will stack normally, where the right column would be on the bottom, or choose to stack content with the right column on top. Anywhere you see the "Browse" button within Composer, you can upload an image from the Media Library or from your computer. Either select the image from the Media Library, or upload your image to the Media Library and select it. Click the Embed Media icon. After you have selected your image, you can adjust the properties as described below. TIP: You can add images that are hosted outside of the media library by adding the URL in the image source field. Just make sure that the images will be safely hosted in the same spot for the duration of your campaign! TIP: The Link Padding icon ties all your padding inputs together. So if you change one, they all change for consistency. You can toggle this feature off as needed. 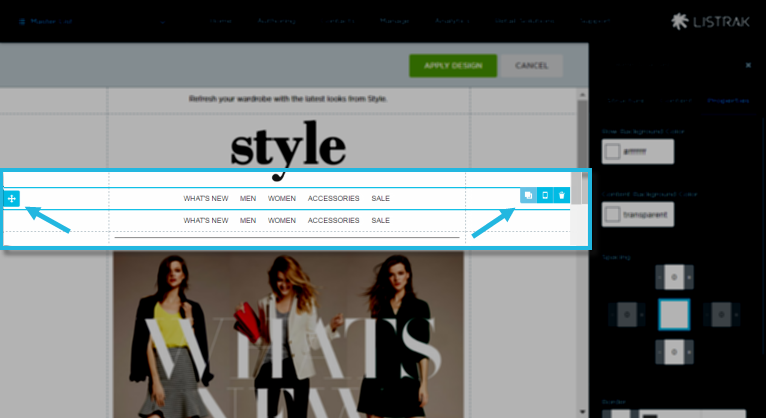 Add navigation components to allow your shoppers to easily click through to what they want to see. 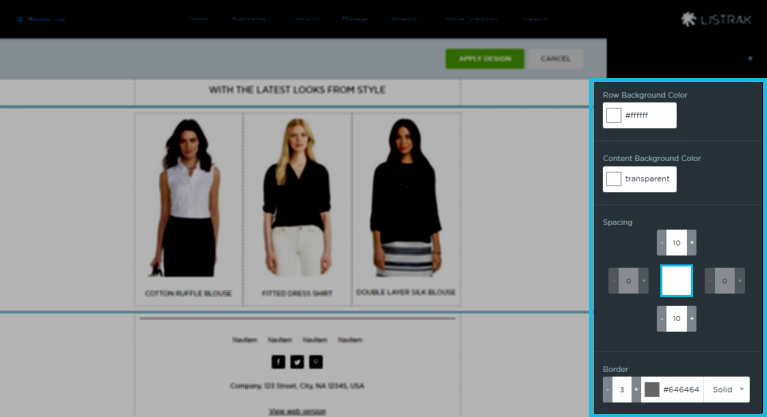 The navigation component is already set up in the "retail" layout. 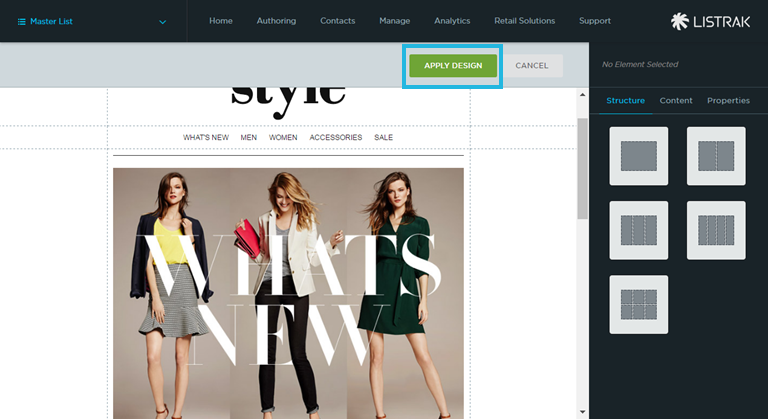 Highlight the navigation component in the layout and click on the Properties tab. Click Edit and give each navigation item a name and URL path. TIP: To add an additional navigation item, click Add Navigation Item underneath your existing navigation items. Navigation Options for Mobile: The navigation component is the only component that offers a mobile layout option. You can choose to have it wrap or stack on mobile. We suggest only stacking navigation at the bottom of an email to avoid taking up valuable real estate at the top on mobile. If you've spent time designing and adding links to a section, you may want to duplicate or repurpose it for another section of your email-- and you can do so easily. Hover over the component you want to copy. Click the Duplicate Structure icon. Your copy will appear directly beneath the original. Now, drag the copy using the Drag icon located on the left-hand side of the row and drag it to the desired position. TIP: To delete any component, click the Delete Structure icon (trash can) and then click Confirm to complete. Include easy-access icons to each of your social media sites. This is typically done at the bottom of the email in or near the footer. 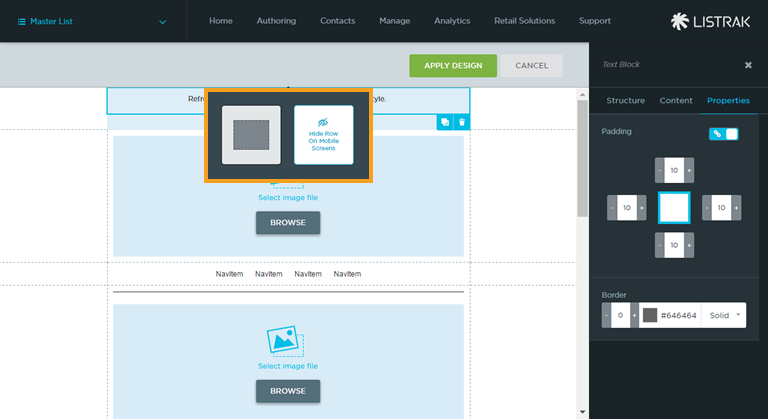 click here to learn more about social icons in Composer. Click on the social media component. Click Edit to modify each social network and add its URL. Choose a Size for the social icons (either small or large). Select a Shape for the social icons (square, rounded, or circular). Lastly, select from the four different Styles available for the social icons. The footer is a good spot to include your required links such as unsubscribe, view in browser, or pass-along. Click the text you'd like to link to the web version of your email. Click the Insert Hyperlink icon. Enter the URL, title, and decoration (or style) for your link in the pop-up settings box. TIP: Check out System Tags and Links to find the links you need, such as unsubscribe, view in browser, et. al. Click Apply Design to save your layout to the message. 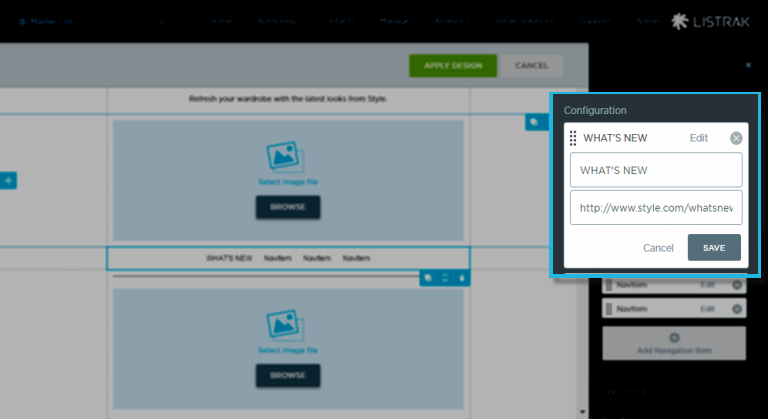 Once you've applied the design and return to the authoring page, you can preview your message by clicking Preview. Here you're able to change the size of the view to show the rendering on desktop, mobile, or a custom width. We've been hard at work adding features to make this powerful design tool even better and easier to use. Check out the list below of our recent upgrades. The first official feedback we received from a client about Composer was to add line-height, and now just a few weeks later we're able to deliver! You can choose from line-height of 1, 1.5, 2, 2.5, or 3, very similar to how it's setup in Microsoft Word. Line-height is based on the font-size and is applied to the entire text component. Branding is important to brands (go figure) and their customers, so we're adding more fonts to satisfy our clients' creativity and voice. Google Fonts provide the web with a large collection of nicely styled web fonts, which happen to offer the best support for email inboxes. With Google Fonts offering over 800 fonts, we wanted to make sure that the fonts we added were the most used by our clients. These are the fonts we selected: Archivo Narrow, Bitter, Lato, Marcellus, Merriweather, Monda, Montserrat, Noto Sans, Nunito, Open Sans, Open Sans Condensed, Oswald, Playfair Display, PT Sans, Raleway, Roboto, Roboto Condensed, Source Sans Pro, Ubuntu, Varela Round. Based on user feedback, we simplified the controls for the button component and also added functionality, making it faster and easier to add a call-to-action. Our users like the simplicity of the social component, so we decided to make the controls similar. 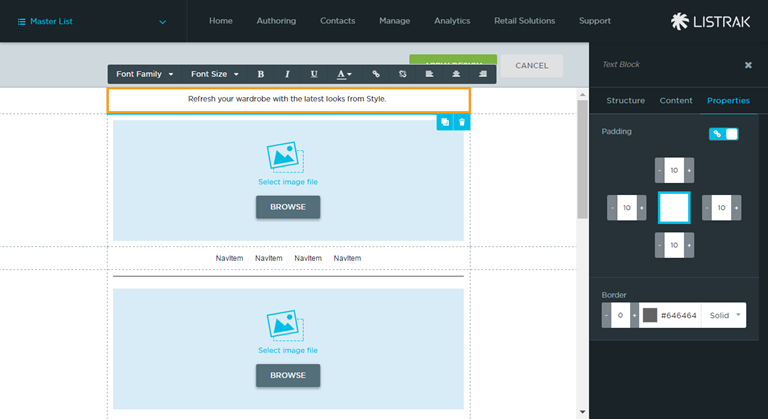 You're now able to adjust the padding around a button to match the padding of adjacent components like text and images. Button size is now much easier to setup by choosing between small, medium, and large. These sizes are based on button sizes analyzed across hundreds of campaigns and will render consistently in all major inboxes. Button shapes can now be controlled similar to social icons by selecting square, rounded, or circle ends. Templates are now available for use with Composer messages. Save time by setting up reoccurring portions of your campaigns in a template, such as header (logo, navigation), footer (social, navigation, unsub, terms & privacy, copyright), etc. You can even create various layouts for different types of campaigns and apply your branded fonts and other styles to minimize the setup time to create each send. Create templates in Author > Content & Media > Templates. Load a template when creating a new message by selecting from the template dropdown. We've added dropdowns in the text component to easily add personalization tags and other dynamic code and fields like the view in browser, unsubscribe, and forward to a friend links, as well as email address and date stamps. 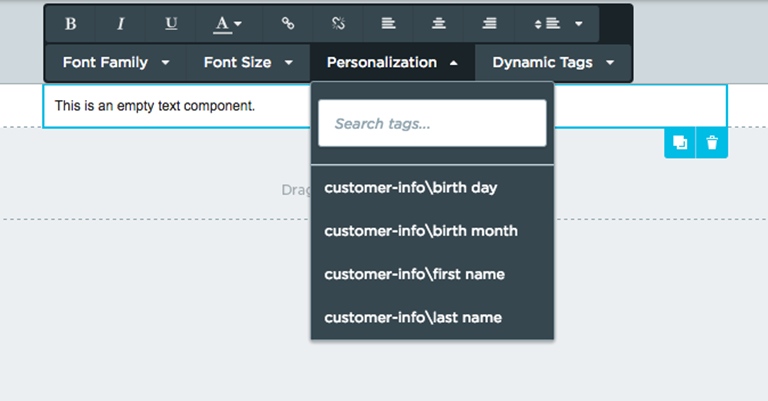 Quickly search through all your personalization tags with a handy search field. It was brought to our attention that some clients were having issues with clipping in Gmail due to the larger file size of Composer messages. Gmail will clip emails that exceed 102 kb. Clipping will also impact open rates, since the tracking pixel is positioned at the bottom of emails. When an email is clipped, content below the threshold isn't loaded, including the tracking pixel. This increase in file size for Composer messages is due to the fluid responsive coding, as well as formatting applied to the code snippets for easier readability. Since code readability isn't a primary goal, we decided to minify the code to get rid of white space and remove all those extra bits of data. With the new minified snippets in place we're seeing reduced file sizes of Composer messages by 40-50%! It's still considered a best practice to reduce the amount of content being delivered in an email, especially for mobile audiences. Users will scroll, but they can only retain and engage with a limited amount of information in the few seconds we have their attention, so make it count. Keep content organized and concise. 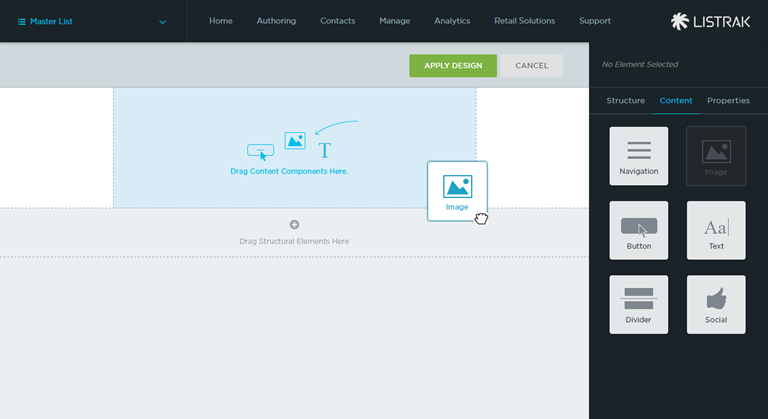 Dragging structures and components above and below the fold of the Composer canvas is now available! This is useful when creating custom layouts, saving time by quickly moving elements up and down without having to recreate elements or stop and start dragging each time.